Life sure can be busy! 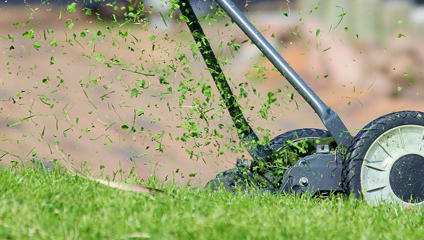 After a long week of work, who really wants to spend a beautiful weekend doing chores – least of all lawn maintenance! Don’t fret! Here are some simple tips that can help you spend less time sweating and more time enjoying your beautiful lawn! Choose a size that’s right for you! 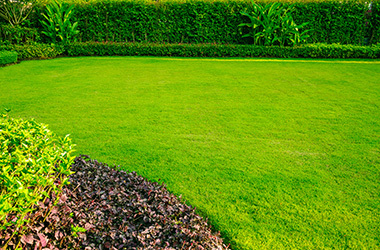 Many people still prefer to fill much of their outdoor space with a grass lawn. 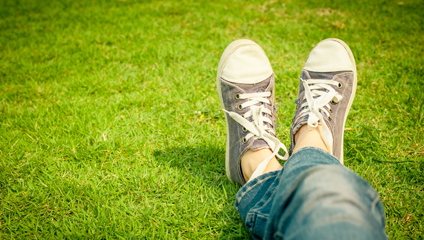 After all, a well-maintained grass lawn can help increase your property value and add all kinds of great benefits, including helping with your summer cooling bill! But even low maintenance grass blends will deteriorate in quality over time, if you don’t give them the attention they deserve. Not one who enjoys hours spent mowing or constantly moving your sprinkler around? As a pleasant, functional space, grass is great! But if you aren’t making use of the whole lawn area, you may want to consider resizing your lawn and adding garden or other plant features to fill in the areas that aren’t widely used. Tired of having to clean up after mowing? Don’t worry about it anymore! Leaving grass clippings to compost on your lawn can help to add nutrients back into the soil and improve overall lawn health. It’s good for your lawn, AND it’s WAY less of a hassle! Water only when water is needed! If you feel like your lawn is a water hog, it’s probably a good time to take a look at your watering regime. Check the weather! During wet and rainy periods, watering isn’t as important. Be aware of the forecast and let Mother Nature do her stuff. On the other hand, during those hot, sunny and dry weeks, it’s your turn to help your lawn get what it needs! That’s not as much work as you’d think. There are some options to help cut down on your sprinkler time! Water only early in the morning. This reduces the amount of moisture lost to evaporation and you also don’t run the risk of developing mushrooms that you have when you water at night. Fertilize your lawn using a maintenance fertilizer with a good amount of potassium. Potassium helps to promote water retention, which can help you reduce your overall consumption. Finally, consider a grass variety that drinks less water! Manderley’s Less Water drought tolerant qualified seed and sod products have been proven to use as little as half the water as a standard variety to remain green. Lawns are meant to be used – to be laid on, sat on, run on, somersaulted on… you get the idea. And not all grasses will stand up to that kind of wear and tear. For that reason, we recommend making sure that your lawn contains Kentucky Bluegrass, which is an exceptionally hardy variety. Don’t let the name fool you: Kentucky Bluegrass doesn’t need to fly south when it gets cold! Actually it’s the best-suited lawn grass variety to our ice-cold winters! Bluegrasses stand up to wear and tear really well – and they’re also rhizomatous grasses, which means they can self-repair!